'Marvel Two-in-One Vol. 2: Next of Kin' review: It started out so well… – AiPT! 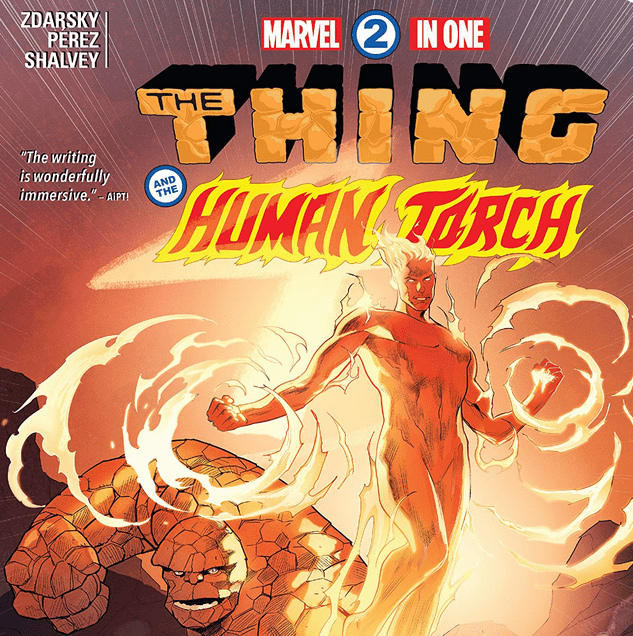 Before the Fantastic Four came back, under the guidance of Dan Slott and Sara Pichelli, we had the Fantastic Two of the Human Torch and the Thing — maybe for longer than we needed them. When Chip Zdarsky’s Marvel Two-in-One burst on the scene, it was at a time when there had been no Fantastic Four book on the stands for years, and people were hungry for some of that old time family exploration, even if it was just a taste. And with superstar artists Jim Cheung and Valerio Schiti, Zdarsky gave fans more than they could handle. The first volume of Two-in-One was some kind of modern miracle, in that it captured the wonder and familial love of old Fantastic Four stories, yet somehow updated things to still resonate with today’s readers. We got the biggest, boldest tales imaginable, like Dr. Doom in Galactus’ body getting punched out by a giant Thing, and all other kinds of Silver Age craziness, beautifully rendered and told by creators at the tops of their games. It couldn’t last, though, and soon the return of Fantastic Four proper was announced. Marvel Two-in-One became almost a victim of its own success, as it was seemingly extended further than its initially planned run. Slott and Pichelli’s book began while Zdarsky’s was still going, and reading the second volume, Next of Kin, it’s hard not to think Two-in-One should have quit while it was ahead. Don’t get it wrong, this collection certainly has its powerful moments. The annual featuring Doom (and art by the incomparable Declan Shalvey, with colors by Jordie Bellaire), along with a later issue that revisits him, give meaningful insights on the good that may still reside in the arch supervilain. And Ben’s final admission to Johnny is one of the top heart-wrenching moments of 2018. But after high adventure from universe to universe, the pair settling down on one world for four issues just feels like a drag, as if Zdarsky had only plotted out one paperback’s worth of stories and had to stretch the ending when Marvel asked for more. No one needs this much time with the Mad Thinker and his Faux Four. What’s worse, with all this extra space, the exciting, new, semi-evil scientist character is barely used, and we’re forced to hurry and catch up with her just as the series ends. And while Ramón K. Pérez is a great artist, his style is about as dissonant with the previous artists as possible, and it can’t convey as much emotion through facial expressions as is needed for this very intimate story. The sparse lines are sometimes hard to interpret, though the tactic does leave plenty of room for colorist Federico Blee to show off. Most of the visual highlights come in the form of his gorgeously hot fires or the creepy purples on weird alien life. Marvel Two-in-One: Next of Kin is a wildly uneven collection that ultimately pales in comparison to the issues that came before it. As with much of Zdarsky’s work, there are amazing highs, along with exceptionally dull, trope-laden lows. The book simply overstayed its welcome once it was clear Reed and Sue were on their way back, so while there are notable moments here, it might still be best if we all just appreciate the first volume for the triumph it is and pretend Next of Kin didn’t happen, as was most likely the plan in the first place. It has some great moments, but much of it just drags. The art doesn't fit the story, the pace is too slow and it's hard to keep track of which characters are where.